On Saturday, May 14th, OCBA moved its Carrboro Demonstration Hives to Carrboro High School (CHS). OCBA members Walter and Cathy Starks, Fred Fesel, Brad Kosiba and John Rintoul provided the volunteer effort to accomplish the move. They were assisted by Stephen Rintoul. The hives will continue to be maintained by OCBA for demonstration purposes, but will be available to familiarize members of the CHS Eco-Action Club and the CHS Beekeepers Club with the principles of beekeeping and the role of pollinators in our natural environment. Setting this move in motion John Rintoul contacted Amy Olsen, a Spanish language teacher at CHS. Amy is a ‘wanna-bee’ beekeeper who directed OCBA to the teachers and staff at CHS who were best positioned to advocate for relocating OCBA’s hives to the CHS campus. Stefan Klakovich, AP Environmental Sciences teacher at CHS, has been working closely with OCBA since late January to secure all of the reviews and approvals necessary to relocate the hives to the CHS campus. CHS Principal, LaVerne Mattocks, and Chapel Hill-Carrboro City Schools Sustainability Coordinator, Dan Schnitzer, also acted as advocates within the school system on behalf of the move. Cynthia Woodsong and Cedric Pearce get assistance from Keith Barnhart loading truck. 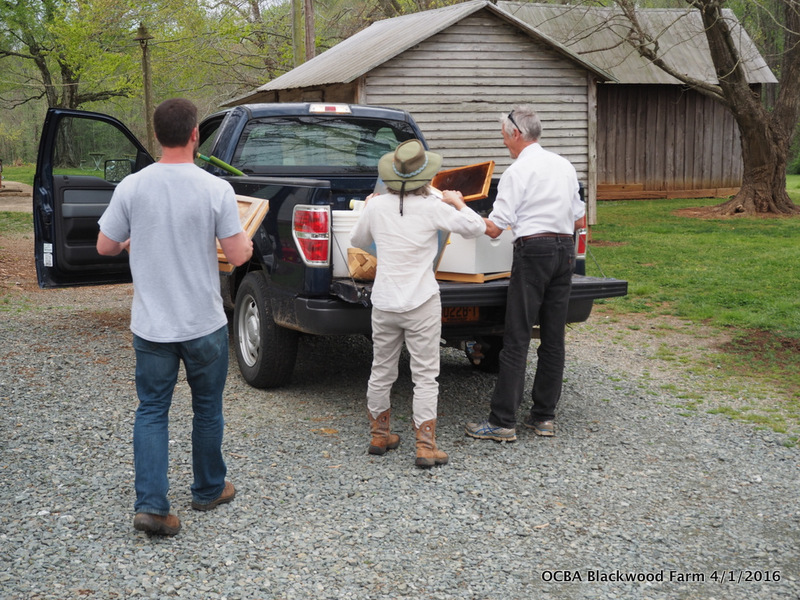 On April 1st, Cynthia Speed, Cynthia Woodsong and Cedric Pearce met at Blackwood Farm Park to install packages in OCBA’s Demonstration Hives. 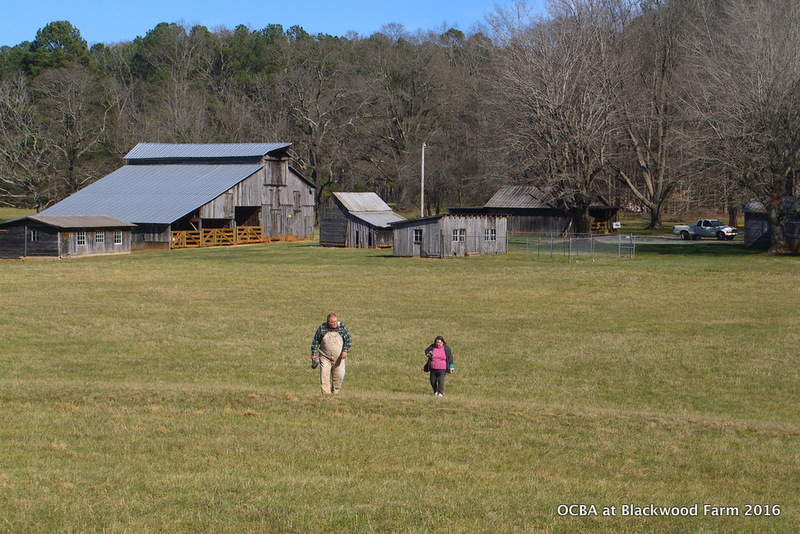 At Blackwood, OCBA willl manage two traditional Langstroth hives and two Top Bar hives. The volunteers sharing the responsibility for managing the Langstroth hves are Cedric Pearce and Cynthia Woodsong. Mary Leonhardi and Cynthia Speed will co-manage the Top Bar hives. The bees for all of the hives were donated by David Bailey of Bailey Bee Supply. OCBA is grateful for the volunteer assistance of our members who manage our demonstration hives and for the generosity of Bailey Bee Supply. Blackwood Farm Park is located near the intersection of NC 86 and New Hope Church Road. It is open Friday, Saturday and Sunday. OCBA members are encouraged to visit the park and the hives. On January 30 several OCBA members met with Keith Barnhardt, Park Manager at Blackwood Farm Park, to prepare for the installation of OCBA’s demonstration hives later this spring. As part of OCBA’s community outreach efforts, the club will maintain two traditional Langstroth hives and two Top Bar hives at the park. The hives will provide a focal point to share information with park visitors about bees and beekeeping. OCBA will also make use of the hives to educate school groups and interested community groups about the plight of honeybees and other pollinators. The Langstroth hives will be maintained by Cedric Pearce and Cynthia Woodsong. The Top Bar hives will be maintained by Mary Leonardi and Cynthia Speed. Blackwood Farm Park is located near the intersection of Highway 86 and New Hope Church Road. Kim Woodward from Orange County EMS will be giving a presentation on bee sting awareness and the use of Epinephrine. We will meet Thursday, January 14th at the Unitarian Universalists Congregation of Hillsborough at 7PM. Registration is now open for the 2014 Bee School! Visit the school page for more information.